The term tiki is applied to carved human figures generally, both by the Maori and by other polynesians. The name possibly has some connection with the myth of Tiki, the first man created by Tane. On the other hand tiki or tikitiki is also a general term for carving in many parts of polynesia, as, for instance, in Niue, where the Tiki myth is unknown and human figures were not carved. 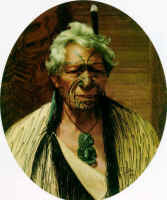 In New Zealand, however, tiki is usually applied to the human figure carved in greenstone as a neck ornament. The full name is hei-tiki. It has been suggested that this ornament is a fertility charm representing the human embryo, and that it should be worn only by women. However, early European visitors saw men wearing the hei-tiki and it is probable that the squat shape of the figure was influenced by the hardness of the material and that it was later likened to an embryo and endowed with magical powers. The shape is also probably due to the fact that tiki were often made from adze blades. Adzes and chisels made from greenstone were also prestige items and the shape of a greenstone adze lends itself to conversion into a tiki. There are several extant examples of half-finished tiki evidently originally small adzes and sometimes on completed tiki, traces of the original cutting end shaping of a adze can be seen, usually at the foot. Tiki or heitiki are most commonly made from nephrite, a stone related to jade and found in several places in New Zealand's South Island. It is called pounamu in Maori, greenstone in New Zealand English. The Maori name for the South Island, Te Wai Pounamu, refers to this stone. There are traditional accounts for the creation of the stone which relate it to the children of Tangaroa. It is a very hard stone and is laborious to work, especially so with the primitive grinding tools available to the neolithic Maori. The tiki in the form illustrated here is unique to New Zealand and arguably the most archetypical Maori artifact, although the word tiki applied to fertility symbols is extremely common throughout polynesia. Greenstone, like jade, is a beautiful stone - classed as semi-precious - and quite variable in appearance. The varieties have Maori names. Its lustre improves with age, reputedly as a result of being worn next to the skin. 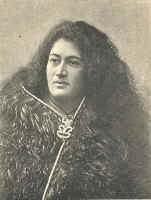 Tiki were worn around the neck - the hei part of the name carries this implication. They are more often, but not exclusively, worn by women in recent times. Suspension is usually vertical but some are suspended on their side. Although the Maori have occupied New Zealand since about 1280 AD, the historical origins of tiki are not understood as they are virtually absent from the archaeological record. For a precious item, this is not surprising because few would have been lost or discarded. Conventionally though they are associated with the later part of New Zealand's prehistory, as nephrite is uncommon in early sites. They were certainly in use at the time of the first contact with Europeans. Some individual tiki have names and traditional histories extending well back into the past. Others have renewed suspension perforations replacing old ones that have worn through, showing they have seen much use over a long time. Sites of manufacture of nephrite tools and ornaments have been found on the east coast of the South Island. 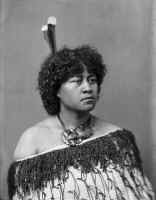 However, the tools and ornaments were much used in the North Island where most of the population lived. Trade and exchange appears not to have been all in finished goods because there are regional styles of nephrite ornaments in the North Island which suggest that at least some of the manufacture was local, either from native stone or from greenstone adze blades. There is some variety in the forms of tiki but this variation has not been very fully studied in relation to region of origin. The head inclined left or right appears to have no particular significance. One clear variation is between tiki with the head upright and those with the head tilted sideways. The likely explanation for the latter form is that it comes naturally from the use of rectangular adze blades as raw material. Iron axe and adze blades rapidly replaced nephrite adzes in the early 19th century and coincided with an increasing market for commercial tiki. Other variations occur in the positions of the arms. In some the arms are asymmetric with one arm on the torso rather than the legs, or up to the mouth. The eyes are often filled with red sealing wax of European origin. Wax was added to the eyes of older tiki, and some have paua (Haliotus, the abalone) shell eyes. Tiki remain prestige items in New Zealand today; heirlooms (toanga) in Maori families and European families as well. They are worn by Maori on ceremonial occasions. Most tiki are not ancient and some are 19th century commercial products but nonetheless highly valued treasures to their owners.